The warm climate is coming to an end in many countries across the world. Autumn is on the way with the winter season to follow next. It is officially time now to load up on some warm clothing and footwear. Dressing up for the autumn is all about dark colours and layering. Once you have a handle on these two priceless skillsets, there is not much that can stop you from looking your best at all times. There are plenty of dressing options out there when it comes to your fall attire. But have you considered taking the denim route this time around? As makers of some of the most coveted denim jeans on the planet, we might sound biased and our inclination to suggesting denim products may appear to be an attempt at maximizing the sales of our products. But think about it, our collection of thick raw selvedge denim jeans are ideal for the cold weather. We have an awesome collection of denim jackets, cotton t-shirts and sweatshirts to go with them as well. So why wait? • Washed Denim Jeans: The rustic look of a pair of washed denim jeans gels well with the dusky nature of the autumn season. When you add a touch of our custom embroidered artwork to this combination, what you get is a unique style that is stand out. Choose from our vast and diverse collection of washed denim jeans to create your own style. There are plenty of designs to choose from! • Double Denim: There are two ways to look absolutely badass in casual clothing. One is by using a leather jacket in your style. The second one is to go double denim. Wear a denim jacket over a plain white or black t-shirt and one of our custom embroidered raw denim trousers. Complete this look with a pair of high top boots in brown. This is a look that will effortlessly get you noticed, especially by the ladies. It has a certain masculine charm to it and it is a hot look. • Denim Jacket and Plaid Shirt: This style is a classic through and through. The denim jacket and a plaid shirt are going to provide you with enough thickness to keep you warm. The rugged combination of both these fabrics will provide your casual fashion with great depth as well. 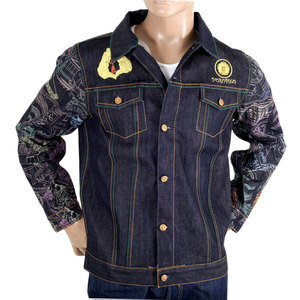 We have a great collection of denim jackets in stock and the ones like the ‘Flocked Tsunami Waves’ denim jacket and the Yoropiko denim jackets feature our fabled custom embroidery designs as well. • Denim Shirts: If you are looking for something that is calm composed and elegant at the same time, look no further than denim shirts. They complement the rugged looks of denim jeans as well as chino trousers. Try one of our plain faded or washed denim jeans with a denim shirt. You can complete this look with plain white trainers or high top brown boots. We have the latest collection of apparels from RMC Jeans currently in stock. Check out now to update your wardrobe with the goodness of our premium denim products.